WATCH Connecticut's Dozen New England Track Champions! Fairfield Ludlowe sophomore Tess Stapleton won a pair of New England titles on Saturday winning the 55 meter hurdles finals in 8.19 (ran 8.18 PR in prelims) as well as leaping to first in the long jump with a personal best mark of 19'1.50". It was a banner day and great meet for the state of Connecticut at the New England Championships winning a total of 12 titles on the track along with Tess Stapleton (19'1.50") of Fairfield Ludlowe in the girls long jump and Chet Ellis (6'9") of Staples in the boys high jump adding to a total haul of 14 championships. The total wins easily outpaced and actually doubled the next best state in Massachusetts of 7 titles. 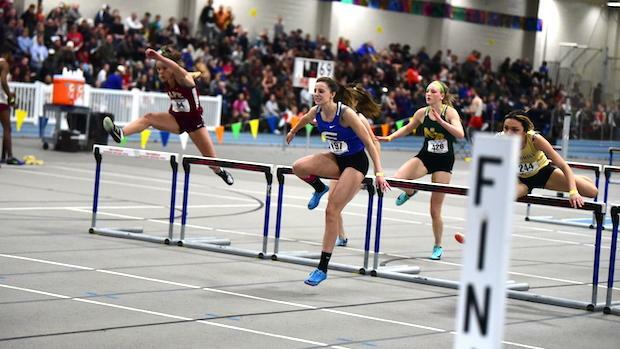 Below can watch all 12 New England titles claimed by Connecticut athletes and relays on the track!